In the spring of 1939 18 year old Ada Vaughan is working as a seamstress and dreams of one day owning her own business. When she meets Stanislaus von Lieben her life takes a turn she could never have foreseen. When he suggests a trip to Paris, Ada ignores the imminent threat of war and crosses the Channel with this man she barely knows. 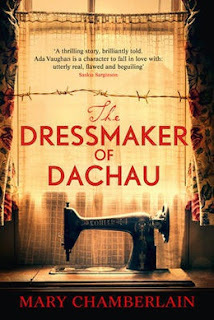 Abandoned in a foreign land and ultimately taken into service as the dressmaker for the Nazis running Dachau concentration camp, Ada's dreams of becoming a modiste never falter. One would be forgiven for thinking the focus of this novel is Ada's life and ill-treatment while at Dachau. However, the story offers a broader scope than this and is just as much about how her experiences during the war shaped her life choices afterwards. Ada is a highly sympathetic protagonist, who is repeatedly taken in by men who promise her a better life. While she thinks she is in control of her destiny, it is clear to the reader that she is merely a pawn in a man's world. Chamberlain's novel is unashamedly dramatic, and readers may be shocked by the final reveal which deftly brings into question Ada's perspective on everything with a satisfying twist. The Dressmaker of Dachau is an engaging and satisfying novel.